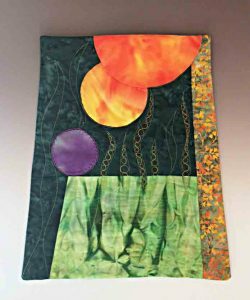 ‘Distant Planet is the second of the Interstellar quilts. Dyed silk combines with commercial cottons and machine quilting to evoke an unfamiliar sky. The shape of the quilt and the green silk reflect the quadrilaterals used extensively in Star Wars. This entry was posted on Thursday, February 9th, 2017 at 4:25 pm	and is filed under Color, interstellar. You can follow any responses to this entry through the RSS 2.0 feed. Both comments and pings are currently closed.